Spicy, sweet, and chockful of veggies, this healthy stew was flavorful, filling, and hearty. 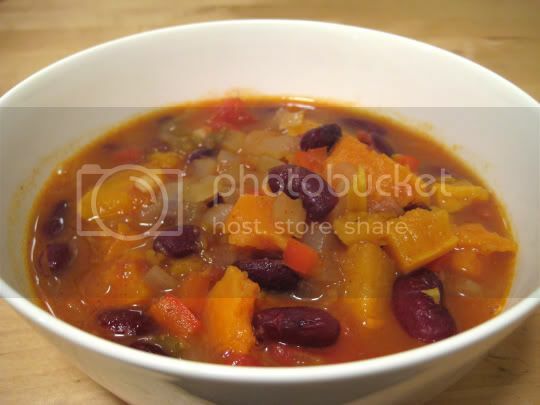 The usual vegetable soup base was used: onion, bell pepper, garlic, beans, and vegetable broth. But added to it were sweet potatoes, hot chiles, and a variety of spices that turned this basic stew into something exotic. The sweet potatoes (plus a tiny bit of brown sugar) really made this, well, sweet. This may sound odd for a stew, but the combination of the sweetness with the veggies was great. I added two chopped serrano chiles, and the heat was definitely evident. Use only one chile for a milder taste. The stew thickened overnight and made it seemingly even more hearty. Leftovers were good, although I added a little vinegar to balance out some of the sweetness. A little tanginess went a long way. Make again? Yes, with maybe some vinegar added during cooking. "Spicy African Sweet Potato Stew," The Vegetarian Meat and Potatoes Cookbook, Robin Robertson. Boston: Harvard Common Press, 2002.